Purchasing a fish tank is the perfect way to liven up your office or home. These tanks come in all shapes and sizes which means that you won’t have much problem finding a model that fits the space in your room. To make things even better, the market has lots of exciting and unique designs that are bound to meet the desires of all users. You can now find great fish tank decoration to personalize the look of the tank and reflect your personality and style. Take a look below to see more. The Marina unit is a great choice for the beginner aquarists as it comes equipped with everything a user might need in order to make the most out of his or her first endeavor in this beautiful and exciting hobby. Apart from the tank, you also get fish food to keep your fish healthy, a water conditioner, a biological supplement, a fish net, and a care guide. All these nifty extras are welcome additions that will save you time and energy as you will no longer have to go shopping for all the tank equipment that your fish need to thrive. If you are tired of your dull-looking cubicle or you just want to make your home look more lively, getting the SeaClear Aquarium is a fast and reliable solution. This combo set includes the aquarium, a reflector, and the electrical 24” light fixture. This funny gadget will make your tank come alive at night as well as during the day. It also plays a practical role as it will give the plants and fish the light they need to grow properly. The acrylic aquariums are clearer than glass with the added benefit of also being 17 times stronger, at only half the weight. If you are searching for a portable fish tank to use in your office or any other room that has limited space available, this sleek and modern option will completely change the look of any room. It comes with vibrant LED lighting with three independent channels: bright white, sparkling blue, and color enhancing light. The plants and fish inside this nifty tank will be able to enjoy an automatic 30-minute sunrise/sunset as well as 60-minute moonrise/moonset that will replicate the natural day cycle. What’s more, this unit comes with a customizable built-in filtration that will make the daily maintenance that much easier. Want to get an aquarium but still can’t justify spending lots of money for it? The Tetra model offers a unique take, as the clear plastic half-moon shaped tank is able to house a few small fish, plants, and some tank decoration. This is a portable tank with a capacity of 1.1 gallons which makes it perfect for small rooms or hallways. It includes LED light that is repositionable, and that can illuminate from above or below. The half-moon shape will give you a full viewing window so that you can admire your fish in all their splendor. The beautiful design of the Marineland unit is breathtaking. 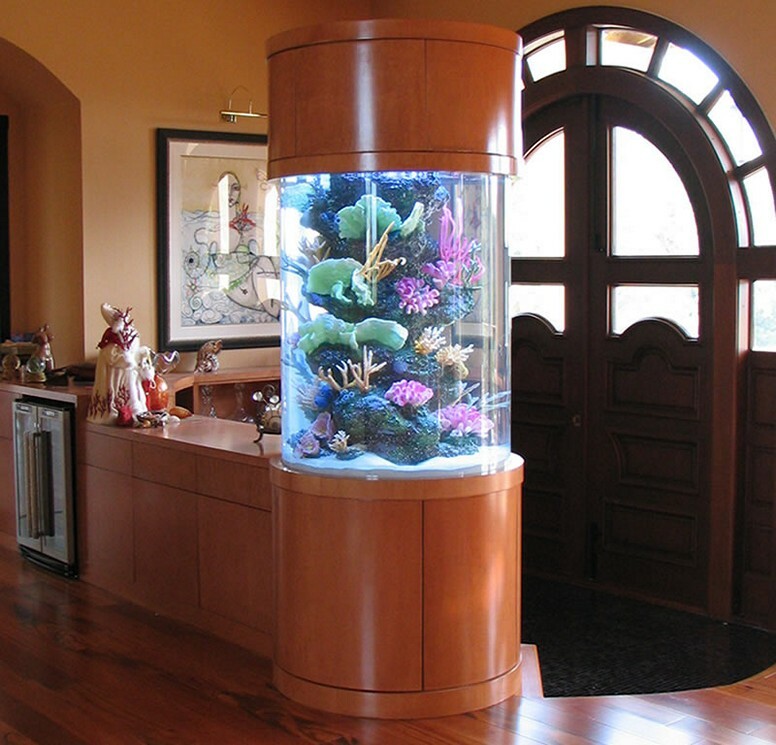 Combine it with the advanced lighting system, and you have an aquarium that will elevate the appearance of any room, office, or hallway to new heights. The white LEDs will create a shimmering light while the blue LEDs are used to produce a relaxing moonlight glow. The advanced 3-stage filtration with adjustable flow filter pump is hidden behind a back panel so that it doesn’t take the attention away from the three clear glass panels. It also includes a hinged light and sliding glass canopy so that you can have easy access to the tank when the time comes to feed the fish or clean the tank. Get everything you need to set up your beautiful aquarium with the Aqueon Starter Kits. This combo includes a 20-gallon aquarium, a low profile LED full hood, a Quiet-Flow LED Pro Power Filter with a medium cartridge, a 100W preset heater, a water conditioner, a fishnet, premium fish food, and a thermometer. If you don’t want to spend hours searching for all these useful items, the Aqueon alternative offers them all with a single and affordable purchase. The filter has a red LED light that will flash when it’s time to change the cartridge. You also get a setup guide to ensure that you don’t run into any problem. If you’re looking for a more affordable kit, the Penn Plax alternative is a great purchase for any novice aquarist, as this fun and functional fish tank features a unique frameless and bent glass design for the best viewing experience. The kit includes the 2.7-gallon tank that is a perfect fit for your desktop, bookshelf, countertop, or nightstand. The Quiet Power Filtration System comes with adjustable flow control and easy disposable and replaceable cartridges. You also get a fantastic fish net to help you catch your fish or clean your tank of debris. A thermometer is also included. This 5.5-gallon glass aquarium comes with pink fluorescent silicone for a look you will not forget very soon. 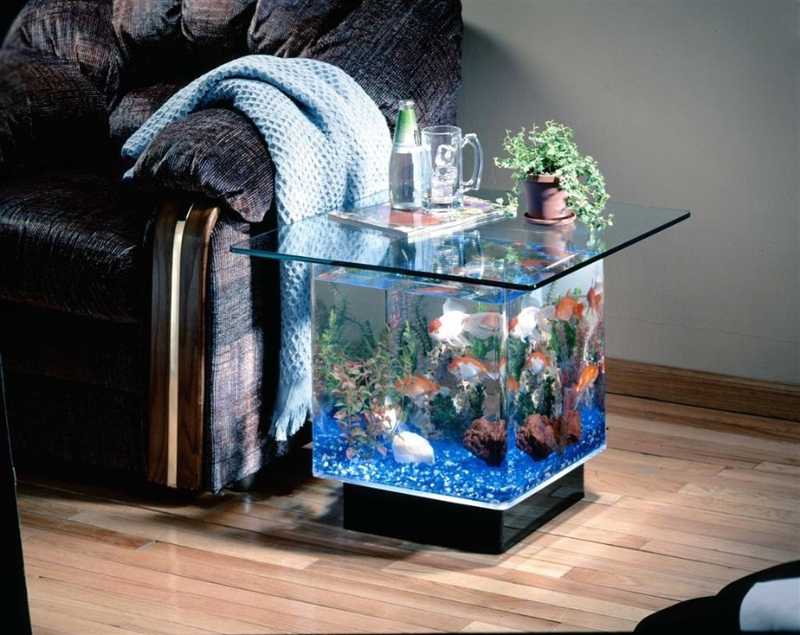 If you want a fish tank that can be the center of attention of every room, this is the pick for you. It features a low profile hood with blue LED lighting that will make your fish and decoration pop out of the glass. It is equipped with an Aqueon mini bow filter and a small cartridge that can be removed and replaced quickly. The black background will help highlight the contents of your aquarium while also hiding the power cords. It includes multi-colored gravel, fish food and water conditioner, and two artificial plants. The Marineland Contour Glass provides you with a quick and stylish foundation to start your new aquarium. The 3-gallon fish tank features an LED lighting system that uses bright white and blue LEDs to show off your new acquisition in the best possible light with both daylight and moonlight settings. The curved glass design will give you better viewing angles than ever so that you can admire your fish from all the possible angles. The glass canopy prevents fish from jumping out and will also help you maintain your aquarium’s water temperature. The canopy can slide, providing you with a gap for daily feeding and water care additions. If you’re looking for an affordable purchase and you don’t want to settle for anything less than the best, the Tetra alternative offers a high-quality aquarium with durable Acrylic glass and a beautiful design. The curved Acrylic glass will mask the corners so that you get perfect viewing angles all around. The illumination system uses energy-efficient hidden LEDs that are guaranteed to last and function properly for years to come. The mechanical filter will pull water from the aquarium and push it through the filter cartridge to ensure that your tank will remain clean and that your fish and plants can enjoy an adequate environment. If you’re a fish lover and want to buy a fish tank, you should start your search early on, because it will take a while to get to it. There are lots of suppliers and plenty of models, and unless you know just what to look for, you’re going to have a tough time deciding what’s best. Finding the right product means opening dozens of tabs to read all the details about the items and maybe find a way to arrange your options according to criteria you’re about to define. Shops for pet products can offer you fish tanks that you can assemble yourself. But you have to search each item separately and build your own system according to your preferences and some technical requirements you need to get the hang of. If you don’t really have time for that, you can rely on our comprehensive guide to find the way to the product you need. It’s a proven fact that people that have fish at home are less stressed than the rest, so you’d better keep it that way. Follow the guide, and you’ll get to a decision sooner than you thought. We started out by an extensive search, and the information that was collected was condensed in a structured way. We’ve taken into consideration all the possibilities that could alter your choices or enhance the chances of getting your hands on some cool fish tanks. Read the clear guide below to find out what to do. Before trying to buy a fish tank you need to know what sort of fish you’re about to keep as pets. That is important because not all fish need the same conditions and they largely depend on the kind of fish tank you’re buying. In case you are wondering, freshwater and saltwater aquariums are interchangeable, but there are differences. The substrate used for fresh water is usually gravel, but you’d have to change it for sand and crushed coral in case you go for saltwater. That’s because it’s what critters love more. Also, you’d have to use more filtration for saltwater, doubling it would be great. At the same time, you’d have fewer fish. If the general rule is to have 1 inch of fish per gallon of fresh water, the salt water rule is to have 1 inch of fish per 5 gallons of water. Finally, the number of fish will determine how large you want the aquarium to be. Some fish need more privacy or grow bigger, or require a whole ecosystem to work for them, while others are ok with just a tiny space. Talking about space, there’s one thing you need to know. The bigger the fish tank, the better. Experience shows that water changes don’t happen as fast as they do in smaller fish tanks, which is a safety precaution. In other words, if something is broken or a dead fish goes unnoticed, more water will make the problem smaller and give you time to fix it. Smaller aquariums, down to fish bowls, are cute but need constant care and any problem can become deadly. On the same line, what’s also relevant is that most people who own fish want to have more and they sometimes can’t do that because of the limited space in the tank. Overcrowding the fish is just another way of causing problems. Filters are necessary when the tank doesn’t come with a built in filtration system or when you just want to change it. But first, you need to know if the system is like you expect it to be. A healthy environment in the tank can be achieved if you use all three filtration methods, but fish owners usually choose one that can perform more than one task, depending on the needs. Mechanical filtration helps eliminate the debris from the water. Any uneaten food or waste is removed using canister filters, granular activated carbon (GAC), protein skimmers or under gravel filters. Chemical filtration uses activated carbon to absorb the substances that cause discoloration and odor. It also removes medications used in the water or and copper treatment. It also works through canister filters and mangrove plants. They are capable of straining toxins and turn saltwater into freshwater. Biological filters also use activated carbon, wet-dry trickle filters and live rock filtration. Live sand also works as a natural nitrate reduction method. The wet-dry trickle filters are the most flexible system, as they can work for all the purposes, meaning mechanical, biological and chemical filtration. It’s difficult to go through the pros and cons of these methods, but the best fish tanks reviews favor the activated carbon or the wet-dry trickle filters and probably the most popular is using power filters. Those of you who have tropical fish should install a heater, to bring the average temperature of the water to a standard of 75 to 80 degrees. Cold water species will be just fine as long as the room temperature is constant, but not all of them are as resilient as goldfish, so you should read about it first. The lighting system must be chosen in such a manner that you can make the best out of the beauty of your fish. Discreet lights are recommended when you want to highlight the vivid colors of your livestock. You can use standard or fluorescent light bulbs that are easy to replace, while large aquariums look better with metal-halide lamps. LEDs, however, are becoming quite common. Light placing depends greatly on the design you choose. If you’ve managed to decide on the other aspects, you’ll be thrilled to find the right design. Tanks that we were used to look quite similar. It’s a glass or acrylic box filled with water and covered with a lid, or a small round bowl. Modern design has a multitude of other options. You can put fish to hang up on walls; there are cylindrical tanks, square or tall. Some of the most attractive you can find for sale are in the shape of a round medallion, a window into the water world. The choice of substrate and decoration can give the fish tank a lot of charm, so pay great attention to it. Rocks and sand, as well as plants, can endow it with a unique charm.